It’s easy to get wrapped up in all of the holiday sales and forgot to embrace the joy of seasonal cheer, but for those of you who plan to spend the holidays In New York, there are several opportunities to reawaken your Christmas spirit. Before closing the chapter on 2018 to welcome the new year, check out some of the things you can do to make the most of your holiday season. Following the Christmas tree lighting ceremony on Nov. 28, the 72-foot-tall Norway spruce will be available for viewing until Jan. 7, 2019. Featuring 50,000 lights and a 9-foot-wide Swarovski star on the very top, this dazzling site will surely put you in the Christmas spirit. Located Rockefeller Plaza, between West 48th and West 51st Streets and Fifth and Sixth Avenues. You can’t say you truly celebrated Christmas without stopping in midtown to witness the elegance of the Radio City Rockettes. Prepare to watch “Parade of Wooden Soldiers” and more holiday classics played out in front of your eyes. The winter village has been opened since Saturday, Oct. 27, which means New Yorkers and visitors have until Jan. 2, 2019 to explore 17,000 square feet of holiday shops, restaurants and an ice skating rink. Get away from the bright lights of Manhattan to get closer to the Christmas lights of Brooklyn. Each holiday season, residents in the neighbor put their best and brightest holiday-themed decorations on display for all to see. While there is no charge, some homeowners ask for donations so they can continue to put on this festive display each year. The MET is once again bringing back its Christmas Tree and Neapolitan Baroque Crèche exhibit which features an assortment of holiday decorations. After viewing the themed adornments, guests should direct their eyes to the foot of the tree to check out the Neapolitan Nativity scene. They can also circle back around at 4:30 p.m to experience the daily tree lighting. Additional lighting ceremonies are given on Friday and Saturday at 5:30 p.m. and 6:30 p.m.
You don’t have to break the bank while visiting stores like Bloomingdales, Saks Fifth Avenue, Macy’s, Bergdorf Goodman and Lord & Taylor this holiday season, as long a remain on the sidewalk. From Herald Square all the way up to Fifth Avenue the major department stores in NYC are famous for their overtop holiday window displays. Although the business most likely paid a pretty penny to set up the extravagant visuals, you and your loved ones can enjoy free of charge. More than 150 vendors in Union Square Park will begin selling food, candles, handbags and other trinkets that would make the perfect addition to any holiday gift list. The vendors are expected to close up shop for the season on Christmas Eve. Christmas isn’t really complete without spending some time on the ice. The Bryant Park Ice Rink could be considered one of the most fun activities in NYC. Whether you choose to rent skates for $20 or bring your own, be sure to visit the rinkside pop-up restaurant, The Lodge. Along with choosing from a variety of tasty goodies, customers will also have the option to grab a drink and hang out in the outdoor beer garden. The rink and The Lodge will remain open until March 2019. The Rockettes aren’t the only ones who know how to put on a show. Christmas lovers can grab tickets to The Nutcracker to witness the classic tale of the young girl, who found herself in the middle of the battle between mice and toy soldiers. 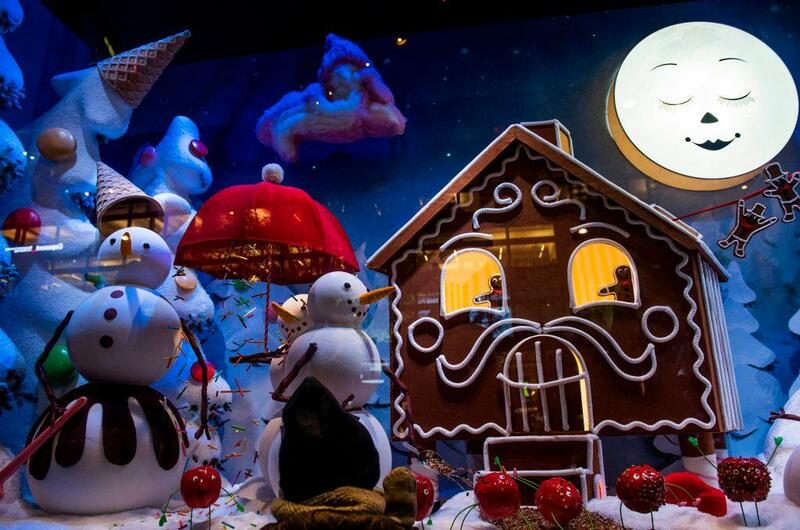 Macy’s will offer more than just a window display this holiday season. Take the family on a trip to Santaland, just remember, Santa Claus is a busy man so be sure to make a reservation. While admission is free, those who are hoping to snag a picture with the man in the red suit will have to pay the cost. Professional photo packages start at $20.99.